Have you forgotten your Windows 7 password ?. No problem!! Our easy steps will help you to Reset Windows 7 Password easily. In this post, we will tell you about tricks to Reset Windows 7 Password without knowing the previous password. This method will work almost 100% in Windows 7. We have used command prompt for this trick. Just follow the given steps carefully and you can Reset Windows 7 Password without any trouble. Click the Start button . In the Search box, type Command Prompt, and then, in the list of results, double-click Command Prompt. Reset Windows 7 Password using CMD. Step 1: Reset Windows 7 If you are already logged in the system. Make sure that you are logged in as an Administrator. This will give you all the access needed in Windows 7. 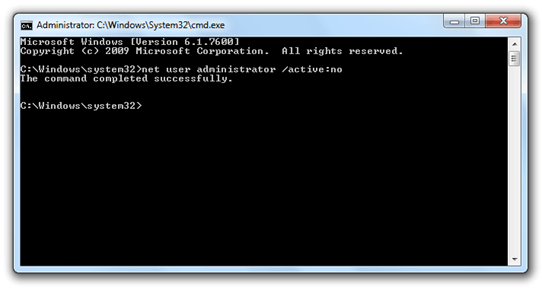 Open the command prompt by above given method. Or just press Windows + R key and typecmd.exe. You can also searchforcmd in Windows search box. Just click on Start button and typecmd in search box. Type net user in the screen. This will show multiple users that are added to PC. Now type: net user username newpassword. Change username with Windows account, and password with any new password. Username should be the Windows account for which you have forgotten the password. If you do not have any other account, then use the default account for username. Press enter. Congrats, You have Reset Windows 7 Password of your account. Step 2: Reset Windows 7 Password If you are not logged into the system. Its a tough step to follow and might not work in some systems. But still you can try. Type Alt+ctr+Del key while the login screen appears. This will open default admin account (If you haven’t already messed up with your system). Type Administrator in User ID field and press enter. You are successfully logged In the safe mode. Now follow the same steps from Step 1 and you can easily Reset Windows 7 Password. Note that Administrator account of Windows is created as a default while Windows is installed. Hence you can easily access these account via Safe mode.Just follow the below steps to log into administrator in Safe mode. Just type Alt+Ctr+Del while login screen appears during safe mode. Note: Opening a program using administrator access will grant you extra rights. You can always open a programme or a software using admin access. Just right-click on that programme and click on “Run as Administrator”. Most of the time this will solve your 50% of the problem. We hope that above tutorial will fix your problems of Windows 7. Till now you may have Reset Windows 7 password by changing the password. If you are facing any other problems in your Windows, then let us know by commenting below. We will try to solve it using some easy methods. Also do subscribe to our newsletter to get important updates. If you are still facing any problem in any steps, then comment below. n Hw to reset d password using d CMd. pls I need ur help explain it more. pls. I will b expecting ur reply in my email.